The retina is made up of light-sensitive thin layers of tissue. As a crucial component to the eye, the retina plays a major function in vision. The retina is constructed with billions of unique cells designed to transfer endless nerve messages that are sent to the optic nerve and forwarded to the brain where images are produced. A severe blow, medical error, or other condition can cause a serious eye disorder where the retina peels away from the supportive tissue, often leaving the victim with significant vision loss or blindness. The macula is located at the center of the eye's retina. The nerve activity at this location helps keep the vision in tight focus to produce a sharp image. When the macula is injured or blood supply is altered, it can produce dramatic maculopathy, causing significant vision loss. Maculopathy is usually caused by blunt trauma directly on the eye or face. It can cause a significant eye injury such as the development of small holes, tears or rips that lead to retinal detachment. Victims of early-stage retinal detachment often have significant warning signs when "flashers" and "floaters" suddenly develop. The brief flash of light, blurred vision, peripheral vision darkening and sensation of eye heaviness are early indicators of retinal detachment. 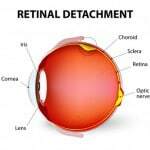 However, many of the common symptoms and signs of retinal detachment do not appear immediately. Usually, when the condition is initially diagnosed, immediate medical treatment is necessary, requiring the skills of a competent eye doctor to perform surgical procedures. The patient can lose functional vision of the eye when the macula detaches from the retina if the condition is not treated as a medical emergency. Even though broken bones and open wounds can heal eventually, most injuries involving retinal detachment often leave the victim with permanent vision loss or blindness. When repair is available, it usually requires extensive ongoing surgeries, vocational rehabilitation and extensive medical care. In many incidences, the victim is unable to continue working at the same occupation and the enjoyment of typical daily activities will likely be altered dramatically. Any victim that suffers any one of the initial warning signs of retinal detachment should seek competent medical care immediately. Avoiding the warning signs can be extremely dangerous to the victim's long-term health. Not only can urgent medical care save some of the victim's sight, but documenting the injury can serve as an effective tool to support a claim for compensation should the victim choose to file a claim or lawsuit for recompense. To be successful in obtaining compensation through a personal injury claim, the victim is required to prove evidence of loss and responsibility of another individual or entity. The victim will need to show how others were negligent and legally liable for causing the injury. Parties that can be found liable might include a driver involved in a vehicle accident, a doctor causing injury through medical malpractice or property owner negligent in providing a safe environment for visitors. However, obtaining compensation in a personal injury claim or lawsuit is often difficult. This is because state tort law is complex. Handling a claim often requires a comprehensive understanding of eye injuries, medical terms and the law. Anyone suffering a head injury should caution on the side of safety and seek immediate medical and legal help. Rosenfeld Injury Lawyers LLC are highly experienced in handling head injury claims including retinal detachment cases caused by the negligent action of others. We encourage head trauma victims to call our law firm at (888) 424-5757 immediately to schedule a free consultation to discuss the case. Our Chicago attorneys accept Illinois injury claims on contingency to avoid the need of paying any upfront legal fees.